Edmontonians are being asked to donate spare change to social services instead of giving money to panhandlers. Have a Heart-Give Smart campaign is part of an integrated approach to panhandling. The City is working with the Integrated Panhandling Advisory Committee to develop solutions to this complex issue and address it's root causes. 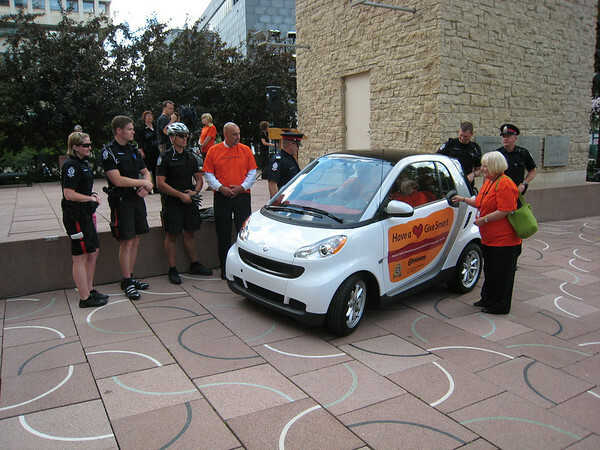 Street teams will be out and about in a donated Smart Car to talk with Edmontonians about how best to help people who panhandle. They will have tips on how to respond to panhandlers and information on the many social service agencies in Edmonton that support people in need. Street teams will also accept donations from those who want to give money immediately. All proceeds will go to Boyle Street Community Services and the Bissel Centre. People donating cash will be given a granola bar, which they can choose to eat or give to a panhandler instead of money. The campaign is focused on downtown Edmonton, Old Strathcona and Callingwood -- areas where panhandling has raised concerns.